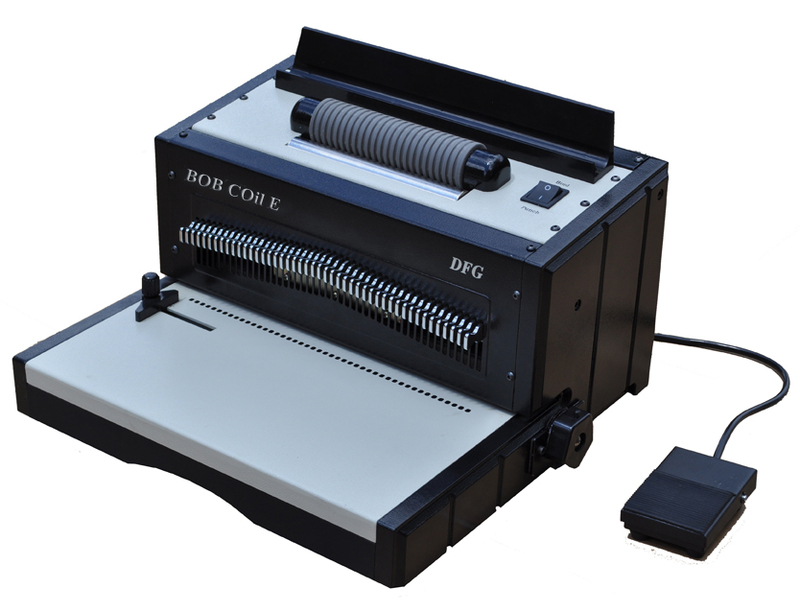 DFG’S BOB Coil E is the first and only extra heavy duty electrical coil punch and binding machine in its class. 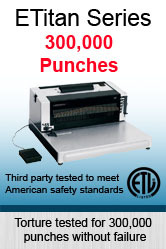 It can punch world record 30 sheets (20#, double D oval hole) or 3 mm hardboard in one punch. This is due to DFG’s Hi-Torq™ punch motor and innovative super strength machine design. With DFG’s SERVOGROVE™ Roller Binding System, it binds small or larger books (up to 22 mm) effortlessly. Lager size coil is not difficult with some practice. BOB Coil E can punch and bind any length and thickness of book. All Electric Operation: Extra Heavy Duty Electrical Coil Punching and Coil Binding with the simple press of a foot pedal. Punches a double “D” oval hole (4x5mm hole) which increases the binding speed and makes it easier to bind thicker books. DFG double “D” oval hole is a True .250” pitch. This is important because plastic coil construction is .250” pitch and this makes it faster and easier to drive the coils into the book. With fully dis-engagable punch pin design, 0.250” pitch is far superior to 0.248” pitch. It makes books stronger and tolerant of paper size fluctuation, which is very common in today’s digital printing (letter size sheets 8.5”x11” cut from 12” x 18” sheets). DFG only uses 0.248” pitch for low cost coil machines that don’t have dis-engagable punch pin design. For any length and thickness book: Punch any length of paper with our open throat die and alignment pin. 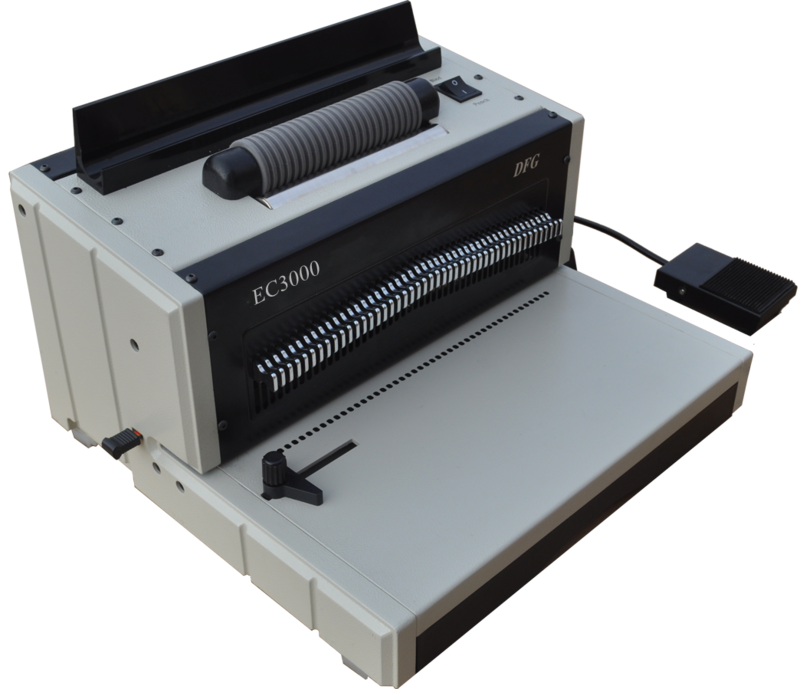 DFG’s design makes it possible to punch paper of any length with no restrictions. Whatever your paper length is, you can punch it on the BOB Coil E. After the first punch, put one hole through the alignment pin to keep your subsequent punches aligned correctly and punch again. You will have perfect alignment for the full length of paper. High Volume Punch Capacity: With our specially designed Hi-Torq™ punch motor, DFG torture tested it for 200,000 trouble free punch cycles. The BOB Coil E can punch 30 sheets of 20 lb paper or 3mm (1/8” thick) hardboard covers with the gentle push on the foot pedal. No other table top punch and bind machine in its class can accomplish this task. Super Strength Punch Mechanism: Cast-hardened & heat-treated precision steel punch pins provide superior strength & hardness. You add DFG’s lubrication system, and that drastically reduces friction and punch pin wear. This equates to longer machine life and a sharp clean perforation every time for the end user. High-Speed, commercial punches that cost over $30,000 lubricate their punch pins. DFG utilizes this technology in our commitment to taking the extra step to deliver the best machine possible to the market place. Heavy duty Chassis: Countless years of experience has led DFG to produce a machine with the most sophisticated design, testing methods, and manufacturing techniques to develop the most rigid heavy duty chassis in its class at 29% less overall machine weight. New Patent Pending SERVOGROVE ™ Roller Binding System: This new roller system binds small or larger books (up to 22 mm) effortlessly. Absolutely no costly separate coil inserter needed. Manually binds any size book. The SERVOGROVE ™ Roller Binding System dramatically increase binding speed, when compared against smooth roller systems by 50%. Once the coil is started, simply lay the book against the grooved roller. 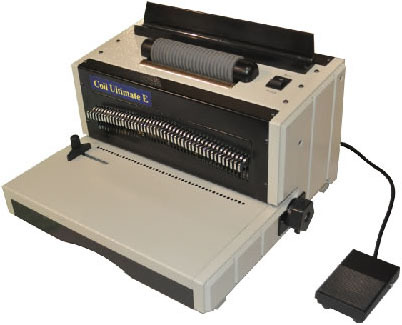 The coil is easily inserted into the book, making this inserter one of the easiest-to-use. Top-mounted roller position will give the operator greater control, improve their efficiency, and have less operator fatigue, which improves production. A foot-pedal activates the roller and is compatible with plastic & metal coils. Full Die Disengagement Pins: Utilizing the DFG’s World’s First full disengagement-pin design for coil binding machines (recently copied by other manufacturers), our punched paper is free from partial punches, on any size project. Our disengagement-pin design uses independent coil spring mechanisms on each pull pin that allows the pins to disengage with a crisp snapping action. Our punch pins are heat treated and precisely ground to ensure consistent, clean, punching. J-Shaped Book Pre-former Guide: It is essential when binding thicker books (1/4” or thicker) to have the ability to form the book to the proper radius of the Coil. This is why DFG has developed the J-Shaped Book Pre-former Guide as opposed to utilizing U shaped pre-former. The J-shaped Book Pre-former Guide supports the book better than a U shape guide because it supports the back of the book better. This solves book buckling and will assist the operator to properly shape the book’s spine, for faster & easier coil insertion. The J-shaped pre-former concept is widely used in larger, automatic binding machines. Exclusive built-in lubrication system to ensure longer punching tool life. Built-in temperature regulating system successfully solves motor over heating issues at high volume environment, which makes machine safer and lasts longer. Anti-Jam Function: For trouble-free punching. Questions? Call DFG at (800) 480-4DFG for more information. Punches a double “D” oval hole (4x5mm hole) which increases the binding speed and makes it easier to bind thicker books. DFG double “D” oval hole is a True .250” pitch. This is important because plastic coil construction is .250” pitch and this makes it faster and easier to drive the coils into the book.With fully dis-engagable punch pin design, 0.250” pitch is far superior to 0.248” pitch. It makes books stronger and tolerant of paper size fluctuation, which is very common in today’s digital printing (letter size sheets 8.5”x11” cut from 12” x 18” sheets). DFG only uses 0.248” pitch for low cost coil machines that don’t have dis-engagable punch pin design. Extended Single Punching Length: Punch any length of paper with our open throat die and alignment pin. DFG’s design makes it possible to punch paper of any length with no restrictions. Whatever your paper length is, you can punch it on the Coil Ultimate E. After the first punch, put one hole through the alignment pin to keep your subsequent punches aligned correctly and punch again. You will have perfect alignment for the full length of paper. High Volume Punch Capacity: With our specially designed Hi-Torq punch motor, DFG torture tested it for 200,000 trouble free punch cycles. The Coil Ultimate E can punch 30 sheets of 20 lb paper or 3mm (1/8” thick) hardboard covers with the gentle push on the foot pedal. No other table top punch and bind machine in its class can accomplish this task. New Patent Pending SERVOGROVE ™ Roller Binding System: This new roller system binds small or larger books (up to 22 mm) effortlessly. Absolutely no costly separate coil inserter needed. Manually binds any size book. The SERVOGROVE ™ Roller Binding System dramaticaly increase binding speed, when compared against smooth roller systems by 50%. Once the coil is started, simply lay the book against the grooved roller. 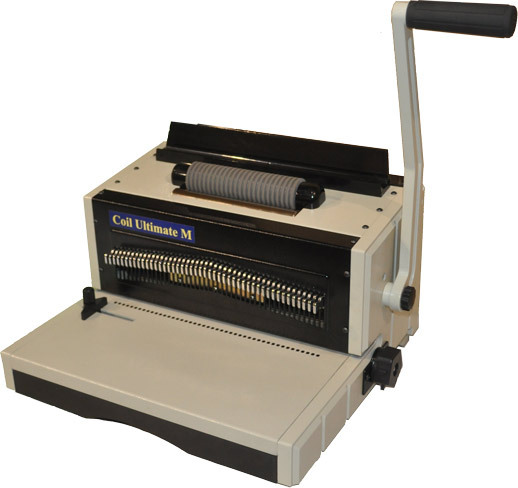 The coil is easily inserted into the book, making this inserter one of the easiest-to-use. Top-mounted roller position will give the operator greater control, improve their efficiency, and have less operator fatigue, which improves production. A foot-pedal activates the roller and is compatible with plastic & metal coils. Extended Single Punching Length: Punch any length of paper with our open throat die and alignment pin. 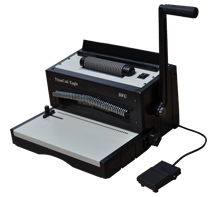 DFG’s design makes it possible to punch paper of any length with no restrictions. Whatever your paper length is, you can punch it on the ETitanCoil Eagle. After the first punch, put one hole through the alignment pin to keep your subsequent punches aligned correctly and punch again. You will have perfect alignment for the full length of paper. High Volume Punch Capacity: With our specially designed Hi-Torq punch motor, DFG torture tested it for 200,000 trouble free punch cycles. The ETitanCoil Eagle can punch 30 sheets of 20 lb paper or 3mm (1/8” thick) hardboard covers with the gentle push on the foot pedal. No other table top punch and bind machine in its class can accomplish this task. Low cost version of EtitanCoil Eagle for the people who want a heavy duty, electric punch and binding machine but have a limited budget. For specs and videos, please see the ETitanCoil Eagle. 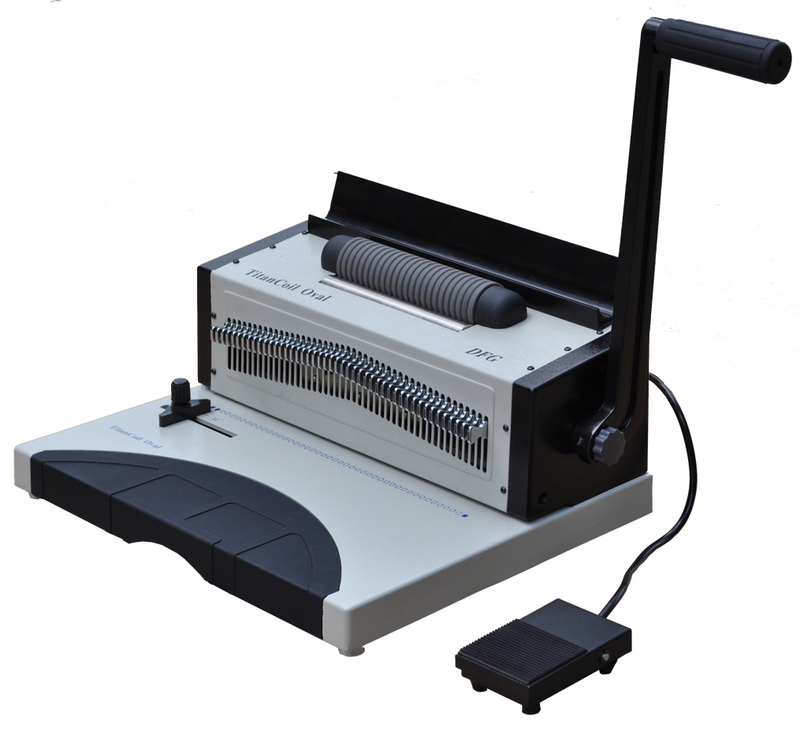 Manual Punch & Power Bind Operation: Heavy Duty Manual Coil Punching and Coil Binding with the simple press of a foot pedal. Extended Single Punching Length: Punch any length of paper with our open throat die and alignment pin. DFG’s design makes it possible to punch paper of any length with no restrictions. Whatever your paper length is, you can punch it on the Coil Ultimate M. After the first punch, put one hole through the alignment pin to keep your subsequent punches aligned correctly and punch again. You will have perfect alignment for the full length of paper. DFG’S BOB Coil M is an extra heavy duty manual coil punch and power binding machine. It can punch up to 25 sheets (20#, double D oval hole) or 3 mm hardboard in one punch, if you have a strong arm. With DFG’s SERVOGROVE™ Roller Binding System, it binds small or larger books (up to 22 mm) effortlessly. Lager size coil is not difficult with some practice. BOB Coil M can punch and bind any length and thickness of book. Extended Single Punching Length: Punch any length of paper with our open throat die and alignment pin. 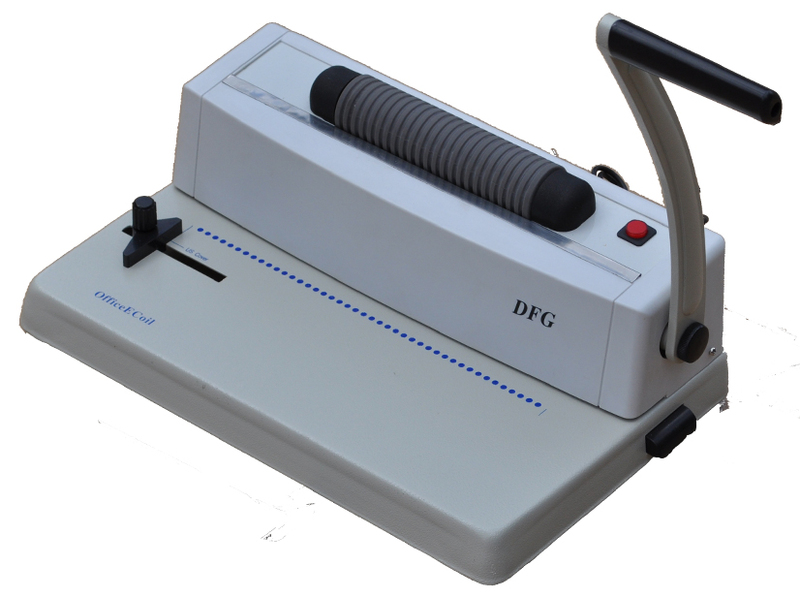 DFG’s design makes it possible to punch paper of any length with no restrictions. Whatever your paper length is, you can punch it on the TitanCoil Eagle. After the first punch, put one hole through the alignment pin to keep your subsequent punches aligned correctly and punch again. You will have perfect alignment for the full length of paper. Low cost version of the TitanCoil Eagle for the people who want a heavy duty, manual punch and power coil binding, but have a limited budget. For specs and video, please see TitanCoil Eagle. TitanCoil Oval - heavy-duty manual punching and electric coil binding machine. TitanCoil Oval is ideal for mid to high volume coil book binding. 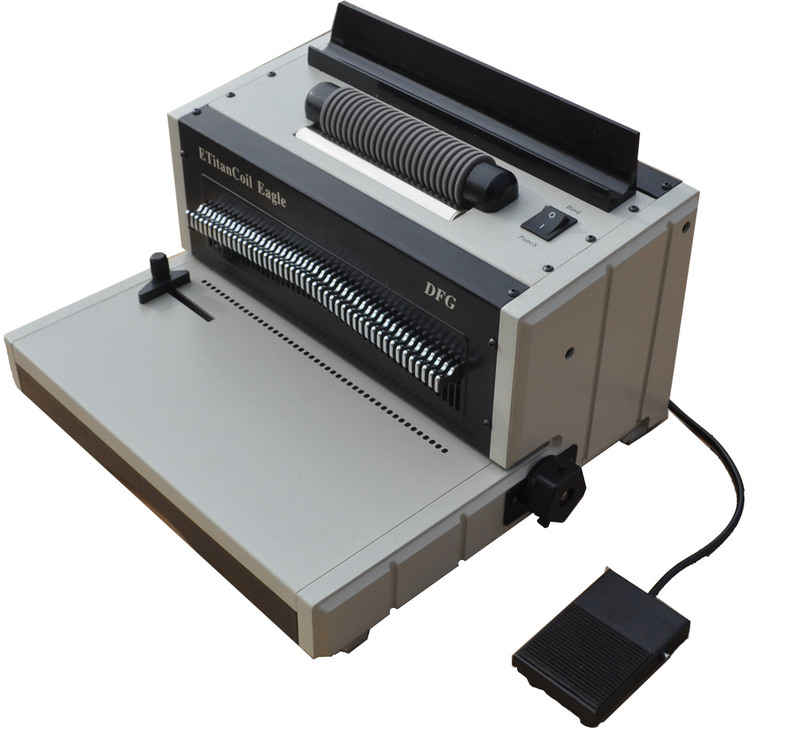 This oval hole punching machine is built upon DFG's industry leading Titan Coil series machines. After one and half years of intensive research and development, this fully featured, new and improved DFG TitanCoil Oval machine, raises the bar for coil binding. Rugged Die Cast Metal Construction: Made of sturdy die-casted metal rather than flexible sheet metal, the TitanCoil Oval is a heavy duty, reliable, user-friendly, and functional machine. DFG uses die casted metal for the base and sides of the housing unit to insure your machine is solid in all the important places which significantly improves machine life as compared to sheet metal base construction. Double “D” Oval Holes: Virtually zero tolerance Double “D” oval hole (4 x 5 mm) further improves the binding and book quality, compared to typical oval hole and round hole. With built-in DFG’s patent pending SERVOGROOVE ™ roller binding system, the TitanCoil Oval machine significantly saves binding time by 50%, compared to smooth roller design. Absolutely no expensive separate coil inserter needed! Fully Dis-engagable pins: ensures a completely clean professional punch without partial punches on any length of paper. Our new design further improves the life of the punching tool since our old design has been copied by other manufacturers. .250” pitch design, for certain size coils, coil will automatically stop after going through the end of the book. .250” pitch design prevents over-shoot. Most binding machines in the current market insert slow and they do not consider over-shoot. DFG engineers developed 0.248” pitch 4 x 5 mm oval hole in 1996 while they were working for another company. The reason for choosing 0.248” is some automatic punches did not have dis-engagable punch pins at that time. In 1996, there was no table top oval hole punch and binding machines. Countless years of experience has led DFG to produce a machine with the most sophisticated design, testing methods, and manufacturing techniques to develop the most rigid heavy duty chassis in its class at significantly less overall machine weight. DFG Punching Tool: Hardened and heat-treated, virtually zero tolerance.